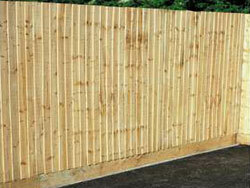 Treated pine fences are your standard timber fence. Palings are overlapped to ensure there is no gap between palings for better privacy. The top of the post is peaked to form a point and a thin strip is routed around the top of the post for aesthetic appeal. Steel posts are an option with all timber fencing. The cost is generally more expensive depending on the thickness of the metal for the posts. Our experienced professionals can install superior quality timber fencing with steel posts to ensure you have a fence that will proudly stand up to any conditions. • If looked after steel posts will last much longer than timber posts and therefore can be re-used when the timber has faded and needs replacing. This will reduce the labour cost of your next fence by approximately half. • There is no risk of warping. 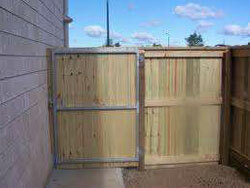 • Steel posts are more expensive for heavier fences due to metal needing to be thicker. • If water and dirt is allowed to poll around base of post, they will rust through at the base essentially destroying your fence. • Steel posts are generally less sturdy than timber posts. 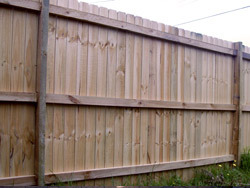 For more information on timber fences or any of our fencing products, call us to arrange a FREE quote on 0423 976 052.